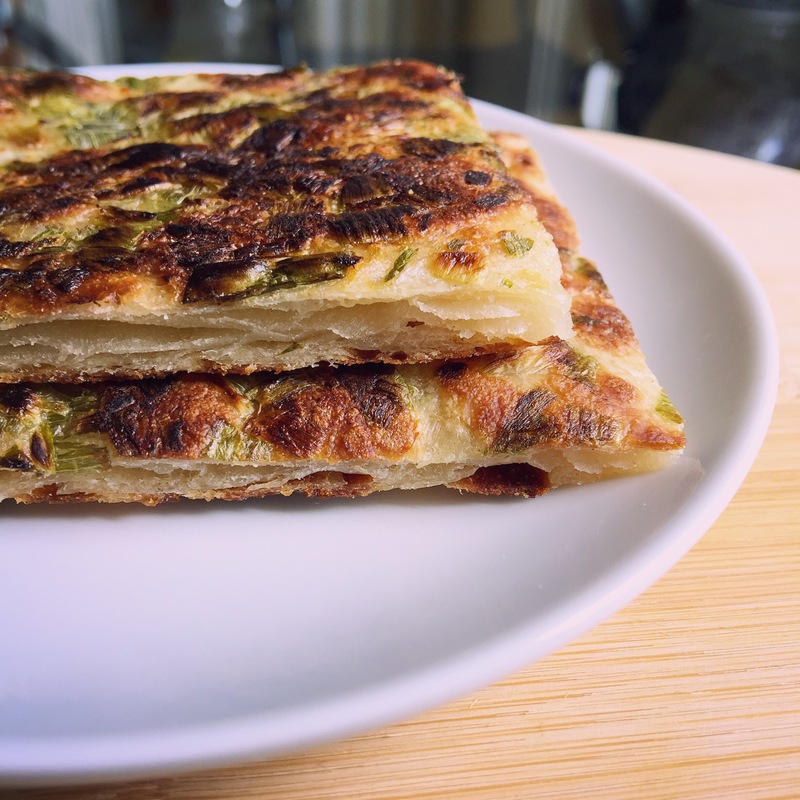 Scallion pancakes are delicious and simple to make at home. I tried a few different recipes online that called for oil to laminate the dough like sesame, but it didn’t result in the flaky layers I was hoping for. Most recipes also didn’t include salt in the dough or baking powder. Instead of using sugar for the sauce, I use balsamic vinegar, which is already sweet and has that tangy element. Combine flour, salt, and baking powder. Slowly pour in the hot water until combined and kneed for about 5 minutes to form a ball. You can use a food processor, stand mixer with a dough hook, or a large mixing bowl and wooden spoon will do! Set aside for 30 minutes. Roll out the dough on a floured surface until about 1/5 inch thick. Brush melted butter on the dough and roll into a sponge cake. Then twist the dough like a snail and set aside for 15 minutes. 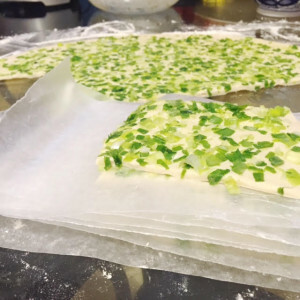 While you’re letting the dough rest, wash and chop the scallions. I find that finely chopping the scallions, then pulsing them in a food processor is best. 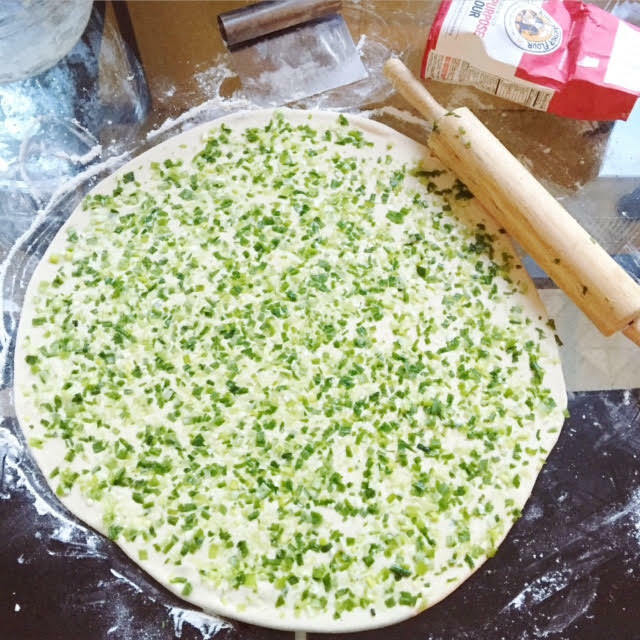 The dough is delicate so you want to make sure the pieces won’t ripe the dough. Once your dough has rested, roll it out again and spread the scallions on top. 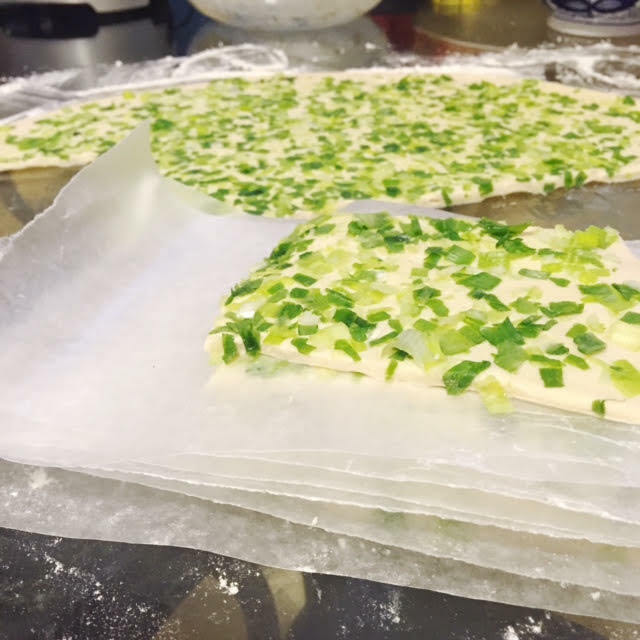 With your rolling pin, roll over the dough with scallions. Cut into desired size. Oil a medium sized pan on moderate heat to cook your pancakes. If you have leftover dough, cut and layer with wax paper to place in the freezer in a resealable bag. Scallion pancakes make great appetizers and also breading for sandwiches! If you’re vegan, you can use vegetable shortening or margarine instead of butter.